In this episode Casey will be discussing some foundational understanding, history that and some strategies in navigating roadblocks trans survivors face. Joining her for this discussion is a fellow colleague, Tyrell Allen, to help lend their perspective on some of the barriers for trans survivors. 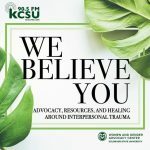 Some resources discussed in this episode are: Janet Mock, QTPOC Colorado, 2015 Transgender Survey Report, and PRIDE CSU. Casey and Jessica spend this episode talking all about sensory grounding – how to engage with your five senses to bring you back to the present moment. If you’ve ever found yourself triggered and are unsure of how to cope, you may find some of the exercises or ideas shared in this episode helpful. We also discuss the use of distracting and comfort techniques in coping, and share a little about their own personal go-to practices when life becomes challenging. In this podcast, Marie talks about the definitions of virginity, what society has taught us about virginity, and why those lessons are problematic. We will also be discussing how this idea of virginity affects survivors of interpersonal violence. And will be joined by a recent CSU grad, Whitney Gustafson, who works her thesis on this topic. Also referenced in the show are the V card diaries and the TedTalk: The Virginity Fraud. In this episode, Casey will explore the importance and healing nature of storytelling. We begin with a brief history of oral storytelling and how this idea can be a powerful reclamation for survivors experiences. The WGAC offers several ways for survivors to engage in storytelling which are discussed and explored throughout this episode. This is a special edition of the podcast. It is a conversation between Tiffani Kelly, a CSU alum and the Assistant Director of the Native American Cultural Center at CSU and Lauren Chief Elk, an organizer, prison abolitionist, and educator who aims her work at reimagining violence against women and justice. They spend the episode exploring the ways in which violence against women affect the indigenous community and words of support.